2018 marks the 19th anniversary of the Annual Giving Appeal Exchange. 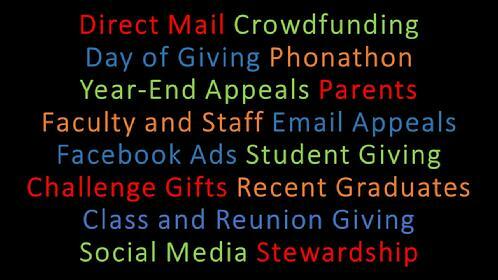 Each year, hundreds of institutions contribute thousands of samples, and what began 18 years ago as a paper direct mail exchange has evolved steadily to include day-of-giving appeals, crowdfunding platforms, phonathon scripts, email appeals, videos, and other types of annual and regular giving solicitations. This year, there's just one way to participate in the exchange -- by sharing samples electronically. In 2013, fewer than 10% of the nearly 400 exchange participants wanted to send and receive paper samples. So, we've yielded to the environmentally-conscious and digitally-minded majority, and we're encouraging everyone to share their samples via email online. You don't need to register. Just share your digital pdf samples, email samples, links to Facebook pages, LinkedIn groups, blitz appeals, crowdfunding pages, YouTube video samples, Web addresses or any else you wish to include. Email your samples and links to: Samples@FundList.info, or Samples@bobburdenski.com. (If your email attachments are too large, use http://www.mailbigfile.com/ or some other file sharing program.) Please include your contact information in your message(s). You can send multiple emails if you like. Please save direct mail pdf samples in a low-file-size resolution, and if possible, sort them by audience so we can group appeals by prospect audience. If you're sharing digital samples only, we'll send you login instructions for accessing the Annual and Regular Giving Appeal Exchange repository. There's no hard deadline for sharing samples electronically, but try to have them to us by July 31, 2018. Please say a few words about your appeals when you share them. What worked well? What didn't? What are you most proud of? Help the other participants understand what "the rest of the story" was with your annual giving appeals. Put some notes in with your sharing. Institutions anywhere in the world are welcome to participate in the digital sample sharing. We will compile a master listing of all participants and their contact names and will post it for participants who have additional questions about specific samples. Please contact us if you any questions. Hope you'll join us for all the fun!